This is my first full combined SOTA/POTA activation. Wasno Ridge sits inside Henry Coe State Park, WWFF/POTA designator KFF-1161. This trip was meant to be a loop, inspired by AA6XA’s trip report for Wasno Ridge and Willson Peak. This would be one of my trail-running trips. However, I forgot one of my water bottles and decided it would be safest to just do Wasno Ridge. The temperature was forecast to rise sharply and I didn’t want to mess with potentially life-threatening heat issues. My planned route would take me up the shorter, steeper way to Wasno Ridge. I had intended to start around 0545, but got started about 20 minutes late. That added to my decision to shorten the trip. The drive there was easy enough, with the exception of a fallen tree blocking most of the road near the destination! I’m pretty sure the tree has been removed by now, but you’ll want to make sure you don’t go too fast on this road. Gilroy Hot Springs Road used to go all the way to Gilroy Yamato Hot Springs. The area has been closed to the public for a few decades. It was purchased and added to the state park in 2003, but they haven’t yet been able to open it for public access as an historic landmark. So the road ends right before a bridge that crosses Coyote Creek. This is where I parked. There was one other vehicle there at the time, and it looked like there would be room for maybe 2 or 3 more cars. Not a lot of room in this informal parking area. The hike/run starts by going around a gate that blocks vehicle access. This route is a bit complicated, so I won’t attempt to detail every turn made. I had to use a combination of the track I had previously drawn on my GPS app, and intuition. At one point, I did have to backtrack—you’ll see that on the map link I included. I was going uphill (which seemed right) but felt like I was pointed a bit too south. I checked my map, and had to backtrack back down the hill, so I could go up the correct hill. This route starts out on a fire road, but very soon takes a turn into the woods to become single-track all the way to the summit ridge. Right near this point is a portable toilet and a trailer. The portable toilet had a recent service date on it and didn’t look too bad inside. There are signed trail junctions periodically, but none that will tell you how to get to Wasno Ridge. The ones that most frequently seemed to point me in the right direction were “Kelly Lake.” And some that even marked the named trails I planned on taking—”Grizzly Gulch” and “Rock Tower” trails. The route starts out pretty steep, flattens out for a while, then gets steep unrelentingly until you arrive at the ridge. Most parts of the trail are easy to follow. Some parts of the route are quite overgrown. This was another of those hikes/runs where the flora and fauna were abundant. I had sightings of both a bobcat and a fox! I also ended up with quite a few burrs attached to my clothing and legs. I was keeping a sharp eye out for snakes of any kind, but especially the rattling kind. There were lots of places for them to hide, lots of mice for them to eat, and with the sun coming up, a reason to come out of their hiding spots and be active. Climbing higher, parts of Wasno Ridge start to come into view. Views into the far southern part of Santa Clara Valley also start to appear. Arriving at the ridge is pretty obvious. If you’ve taken the correct route, you’re no longer climbing steeply! A short climb once you’ve met up with Jackson Road (trail) and you’re in the activation zone. There are a couple of “peaks” on the ridge. Choose your favored spot and you’re good to go! The trees on this ridge are absolutely excellent for antenna wire slinging. Normally, I’d tie the para-cord of my end-fed wire to my half-full water bottle and throw that over a tree branch. Since I had forgotten that water bottle, I found a rock, wrapped the para-cord around it a few times, tied a knot, and used that to send the cord over the branch. For some reason I just couldn’t quite get the underhand swing to work for me this time (it’s worked other times) and ended up doing a regular ol’ overhand throw over a branch about 30 feet up. Beauty. Hooked it up as a sloper to the east, tuned it up, found a clear frequency, and started calling CQ while I worked out how I might spot myself. In anticipation of cell service being a challenge (this park is pretty remote even though really not that far from the Bay Area), I brought along a prepaid “dumb” phone that works on the Verizon network. Verizon has great coverage in a lot of areas not covered by other carriers. I figured if my primary phone (T-Mobile) didn’t work, I might be able to spot myself on the Verizon phone (even though AA6XA had mentioned no Verizon coverage). It turned out, right where I set up, there was zero phone service. Actually, the Verizon phone was reporting it had a signal, but it refused to send an SMS (for SMS-to-SOTA). After fruitlessly calling CQ on 40 meters for about 5-10 minutes, I decided I’d walk along the ridge a little bit to the west—back the way I came. There I found a signal for my iPhone (T-Mobile) and managed to send out a self-spot using the SOTA Goat app. After doing that I quickly ran back to the radio and resumed calling CQ. Within a few minutes I started making contact. I had initially planned on spending only 30 minutes operating on each summit, but since I was doing only the first planned summit, I decided to take my time. Nonetheless, there’s always a little bit of franticness on my part to get set up and get the first QSO. While I had remembered to call CQ for both POTA and SOTA, including periodically giving the identifiers for both, I had neglected to spot myself for POTA. So, after getting a few contacts on 40 meters, I decided to try 20 meters. I found a clear frequency, checked it a few times, and called CQ once. Then I went over to my “cell reception” area about 50 yards to the west and spotted myself, this time for SOTA, using the SOTA Goat app, and for POTA, using the dxsummit.fi site. It was a lot harder to do the POTA spot using the website, since my phone had to load the site and deal with the latency introduced by the weak signal. But the spots did go out. I rushed back to my radio and got to work. On 20 meters, the contacts came pretty easily. I definitely wasn’t dealing with a pileup, but made several contacts. I had an S2S (Summit-to-Summit) QSO with KC4WZB all the way over in Georgia (2090mi / 3363km)—my farthest S2S yet! I also had a somewhat long QSO with Tom, KZ7ZZ. Thanks to the chasers/hunters who patiently waited while Tom and I reminisced about my home town! In between calling CQ and making contacts, I did manage to get out to a local(ish) repeater and get someone to try me on 146.52 from over near De Anza College in Cupertino. With the squelch open, I could tell there was something there, but could not copy. Once I got up to 13 QSOs and the CQ calls didn’t seem to be bringing any more in, I decided to pack it up and get back down. It was getting quite hot and the flies and ants were really starting to bother me. Making 13 QSOs in about an hour is pretty good for me, working low-power sideband. I really can’t wait to get the hang of CW and make things easier on myself. I’ve been getting faster and faster at setup/teardown. I think it only took me about 5-10 minutes to pack up and get moving again. 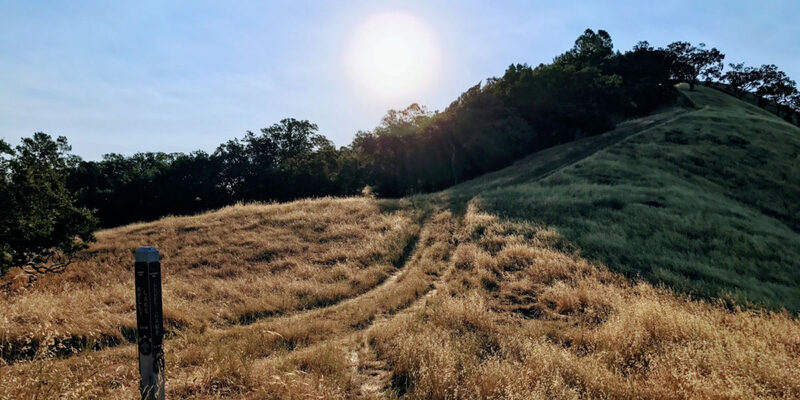 Knowing the route I had taken up to the ridge was very steep and overgrown on many sections, I decided to take the longer way down—the Jackson and Anza trails mentioned in another trip report. This turned out to be a mostly good decision—it was easier on my legs and had fewer overgrown sections. This was a great trip. I was happy to get my first full POTA activation done, and get a nice solid SOTA activation. I’ll be back to get some more QSOs for this park (44 to count for a worldwide POTA/WWFF activation), and to get Mount Willson activated. Thanks to all the chasers/hunters!